Adding a Maypole was inspired by our recent International gathering for the Centennial anniversary of our founder, Dr. Felicitas Goodman. Felicitas was born in Hungary, lived for many years and Germany and was a keen observer of traditional rituals and celebrations. 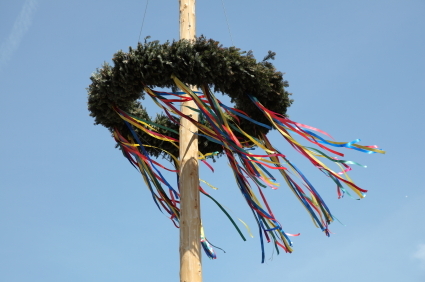 The history of the Maypole goes back to the pagan roots of Europe. First, we will erect a proper maypole. We will then decorate the pole with paint, ribbon, fabric, using symbolism reflecting all of our culture heritage. Once errected and decorated the dance begins. Maypole dancing is a form of folk dance from Germany, England, and Sweden. The maypole is a spring symbol that dates back to pagan times. There are two forms. The first and most popular consists of dancers that perform circle dances around a tall, garland-festooned pole. In the second, dancers move in a circle, each holding a colored ribbon attached to a much smaller pole. As they move around the pole, the dancers intertwine their ribbons either in a web around the pole or to plait it to the pole, itself. To unravel the ribbons, the dancers retrace their steps. The maypole is a spring symbol that dates back to pagan times. 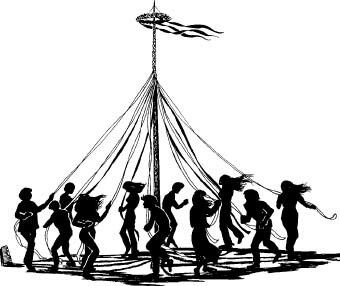 Historians believe the first maypole dance originated as part of Germanic pagan fertility rituals. Originally, the dancers danced around a living tree. While dancers usually perform this dance in the spring on May 1 or May Day, those in Sweden perform it during their midsummer celebrations. I will send you more details as we go forward.